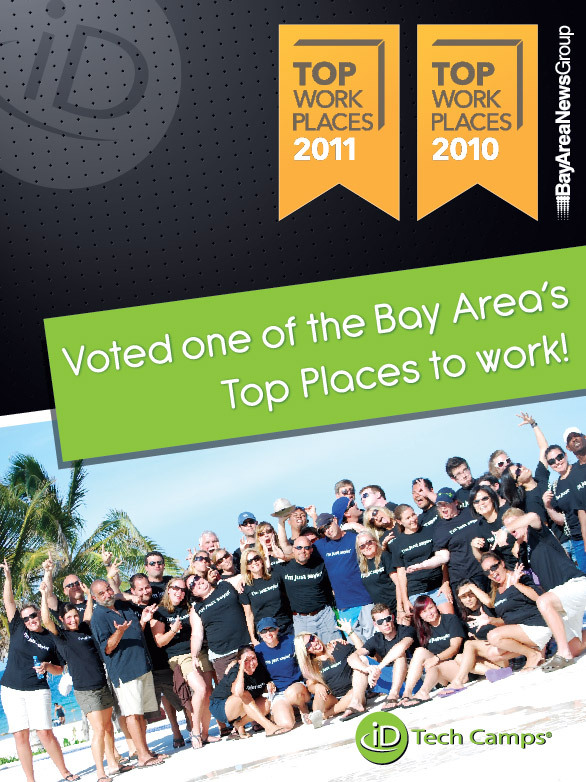 iD Tech Camps Voted One of the Bay Area’s Top Workplaces – Again! What do Bay Area’s Top Workplaces awards, Nerf guns and bubble wrap have in common? iD Tech Camps. We’ve got ‘em all, and we’ve got lots of ‘em. Our company culture is all about providing POS (Positively Outrageous Service) – for our students, and for our co-workers. That special iD blend of work and fun at our summer camps? It flows from the top down. This company culture is part of what catapulted iD Tech Camps into the Bay Area’s Top Workplaces list for the second year in a row. The Top Workplaces awards are compiled annually by the Bay Area News Group, publisher of the San Jose Mercury News, and based on confidential employee surveys. With questions covering leadership, career opportunities and company values, the surveys take a comprehensive look at workplace culture and conditions. Only 65 companies made the list this year, and iD Tech Camps placed 7th in the Small Companies category. Why are our employees so happy? The same reason that we’re the World’s #1 Tech Camp. We’re a family-run company, and we focus on quality. We never cut corners. We push our students to do something BIG, and our employees know that they’re a part of something big. How big? Try 20,000 trees big. We’ve gone green in our mission to educate the next generation with essential STEM (Science, Technology, Engineering and Mathematics) skills. This year marks the start of One Camper One Tree, an initiative that works with the Arbor Day Foundation to plant one tree for every camper in the 2011 season. And with over 18,000 trees already planted, we’re close to hitting our 20,000 tree goal for 2011. Our ultimate target is to recruit other camps to the initiative and plant one million trees by 2015. This strong motivation translates into an unparalleled summer program for students. With energetic instructors and a solid corporate support structure, the iD experience is about hands-on technology, cool projects and ridiculously fun Tech-Reation. And maybe the occasional whipped-cream pie in an instructor’s face. After all, the shenanigans can’t be confined to the main office.